VexxHost Review 2019: Is VexxHost a Good Hosting? With data centers in Montreal, Canada, Vexxhost specializes in private servers, big data, and Cloud Infrasctrure as a Service (IaaS). Vexxhost started out a web hosting and VPS company in 2006. With the advancement of technology, the company started offering private and public Cloud and hybrid Cloud hosting to small businesses and large companies. Vexxhost proudly owns a number of SSAE-16 data centers with redundant power and multiple connections. They combine multiple high-end nodes and optimized could server scheduler to ramp up the speed of their servers. All their hardware is tested, certified, and backed by 100% SLAs. So you’re cushioned against hardware failure which could disrupt your operations. With business growth, comes the need for more static infrastructure. Vexxhost’s private cloud is a reliable and cost-efficient option for businesses that want more resources or storage. Their engineers can design, configure and optimize your cloud infrastructure for performance at the same time slash the costs of maintenance. Unlike other private cloud services, Vexxhost does not tie you down with expensive or complicated licensing arrangements so you can deploy your cloud quickly without incurring a costly licensing fee. Vexxhost offers multiple and flexible methods to create and deploy your Cloud infrastructure. You can choose from hosted or on-site deployment to develop your dream infrastructure. Their team will do all the cloud architecting, testing, and server management as long as you provide the hardware. By offering various deployment options, they ensure you find a solution that meets all demanding requirements. Navigating the backend shouldn’t be a problem. You can access the list of all the solutions you require to build and deploy your Cloud from the CloudConsole area. Horizon, their user-friendly and reliable dashboard, allows you to access and manage your web space, tools, and apps via an intuitive console. From the dashboard, you get a granular view of functions, forms, and testing panels. So it’s pretty easy to correlate existing code with navigation. What I like about Vexxhost is that their dashboard is extensible and reusable. Thanks to templates and base widgets, you can modify the interface and leverage APIs to connect different dashboards and OpenStack apps including compatible ones from third-parties. Vexxhost charges for cloud computing resources by the hour. They will also charge you software license fee, data transfer fee, and a fee for public IP addresses per hour. Their model transforms large capital expenditures into smaller day-to-day operating expenses. With their on-demand servers, you pay for the storage, RAM, and the number of processors that you use something which eliminates the cost of planning, buying, and maintaining hardware. 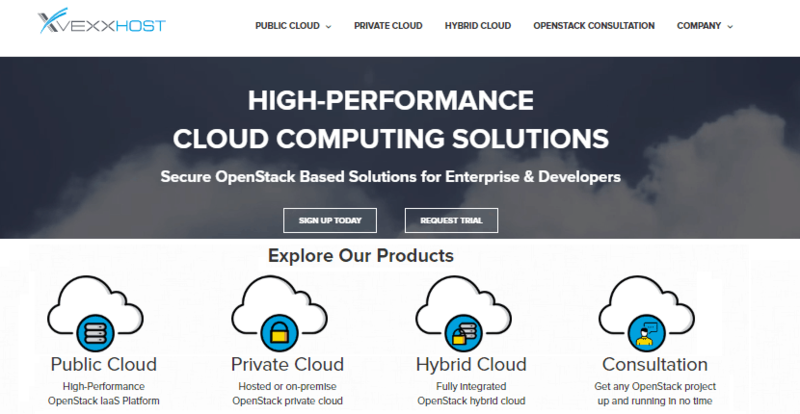 By using OpenStack, an open source Cloud infrastructure, Vexxhost passes direct savings on to you. You don’t have to worry about compatibility issues or vendor lock-in agreements as you will be using open standards. With their on-demand platform, you only pay for the capacity that you use per hour. Servers are deployed quickly. It takes just 30 seconds for the server to be operational from the time you place an order. Behind the scenes is a team of Cloud engineers, network administrators, and support technicians who can help you leverage the power of OpenStack. You can contact them via live chat or open a ticket and ask for assistance. They not only monitor the servers, but provide timely support, satisfactory answers, and make sure that your cloud is secure and available 24/7. With their support, you can focus on your business as they take care of the technical aspects of the Cloud. With competitive pricing and privately-owned data centers with high-quality server equipment, Vexxhost is a good choice for anyone who wants to make a leap to the Cloud. Wondering how VexxHost stacks up against other Web Hosting companies? Enter any other Web Hosting company and we will give you a side-by-side comparison.